Syrian Arab Army discovered arms and ammunition depots of Daesh (ISIS) remnants, including chemical substances, weapons and ammunition, some of them Israeli-made and artillery shells belonging to the NATO. SANA’s reporter in Deir Ezzor said that during the army’s sweeping operations in the villages of al-Salhia, al-Dwair, al-Kishma and Sbikhan to the southeast of al-Mayadeen city in the direction of al-Boukamal, the army uncovered depots which included amounts of weapons, ammunition, some of which Israeli-made and loads for 155-mm NATO cannon, chemical substances, explosive materials and explosive belts, left behind by Daesh. 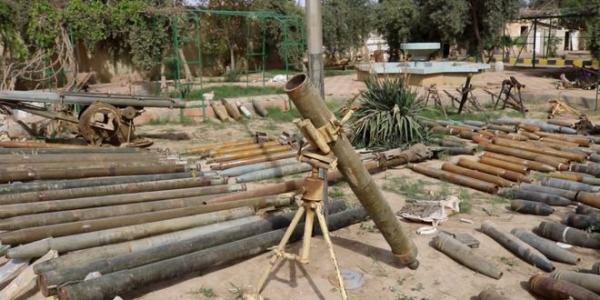 Large amounts of RPG rounds were found inside the 1st depot which was discovered in al-Salhia village, while the depot in al-Dwair village contained rocket launchers and shells of different kinds, the reporter said, adding that explosive belts and mortar rounds of different types, including Israeli ones, and ammo for 155-mm artillery manufactured by the NATO in 2009,were found at the third and the fourth depots successively. In Sbeikhan village, about 60,000 rounds of different kinds and barrels containing chemicals used in the manufacture of explosives, while the sixth warehouse in the village of Al-Kishma included anti-armor missiles.